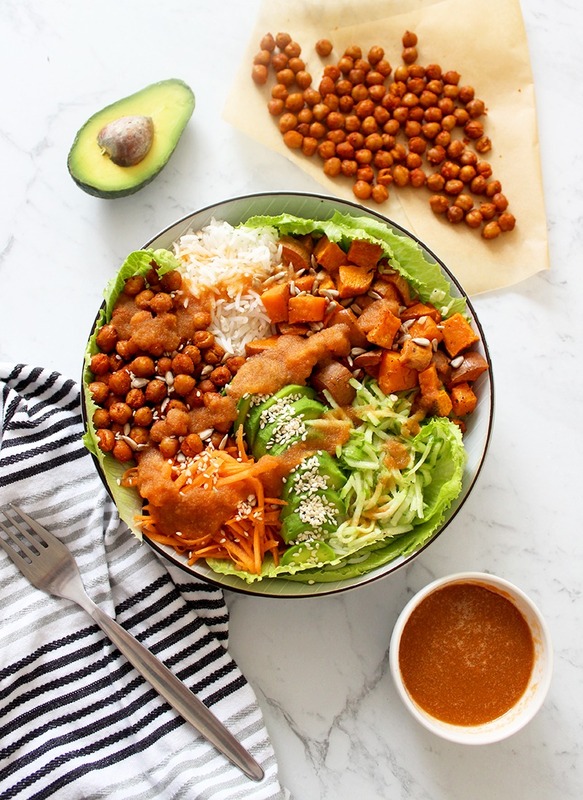 Sweet potato and maple syrup are my idea of a match made in heaven, and here I’ve mixed them with crispy chickpeas, carrot, cucumber, rice, greens and avocado in this delicious Sweet Potato Chickpea Buddha Bowl! This bowl is high in protein, high in fibre and, of course, vegan. Enjoy this simple throw-together meal for a healthy plant-based lunch or dinner. 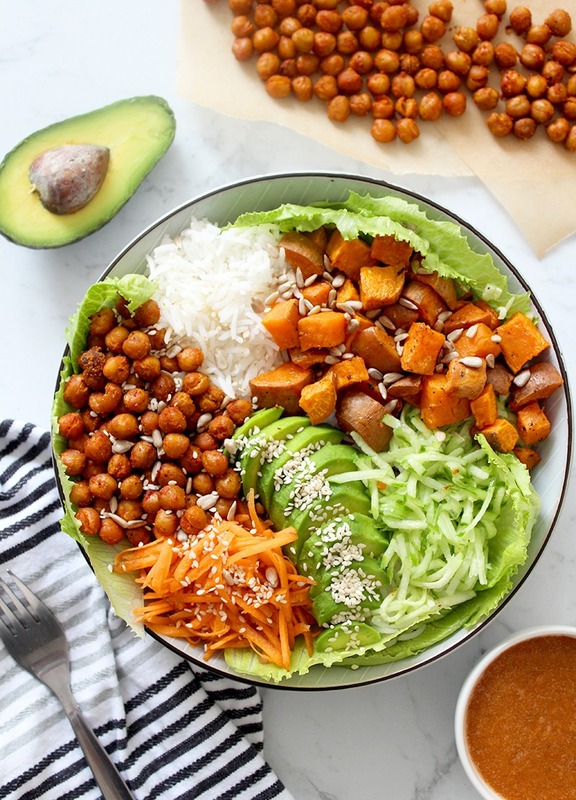 A Buddha Bowl is basically a large bowl of colourful, healthy, usually plant-based goodness, that often includes grains, veggies, carbs, protein, sometimes nuts, fruit and a sauce to drizzle on top. They’re a wonderful meal to experiment with colour, flavour and texture. While they’re easy to switch up and of course there are no strict rules when it comes to making a Buddha Bowl, there are some guidelines for what you might like to include. They usually consist of at least one from each of the following categories. This is usually the base of your Buddha Bowl and offers a great medium to mix all your other ingredients into when you’re ready to chow down. You could use quinoa, couscous, rice, rice noodles, potatoes, pumpkin, or a combination. Here is where you can add in your chickpeas, lentils, beans, tofu or tempeh for a portion of protein. I opted for roasted crispy chickpeas to give this Buddha Bowl some crunchy texture. Here you can include raw veggies or cooked veggies depending on whether you want your Buddha Bowl to be warm or cold, crunchy or soft. This is where you can get creative with your colours and textures. You might want to try adding some fermented veggies for something a little different and a boost of nutrients. You can completely change the vibe of your meal by switching this option up a tad. You could try a pesto, tahini dressing, simple lemon juice, soy sauce, hummus, guacamole or peanut sauce. I opted for a maple carrot sauce in this Buddha Bowl to complement the carrot and sweet potato in the bowl. You can throw in some extra healthy fats, colour, texture and taste by sprinkling your bowl with any mixture of delicious toppings. Shaved almonds, walnuts, peanuts, sesame seeds, sunflower seeds, pepitas, hemp seeds, coconut flakes and croutons all make great choices. You can easily meal prep this or any Buddha Bowl by preparing the cooked veggies, grains and legumes, as well as the sauce and any toppings ahead of time. Keep everything in separate containers in the fridge so that you can easily assemble your bowl using these pre-cooked foods, all you have to do is add the fresh ingredients. Alternatively, if you want to prep a Buddha Bowl to take to work or school, you could assemble and store your prepped food in the one container and just add the fresh ingredients the morning of. 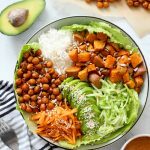 Buddha Bowls have become super trendy over the last couple of years and I think this is such a great thing! They’re extremely healthy for our bodies and minds, so easy to throw together whether you’re following a recipe or using up your food at the end of the week, and (my favourite part) you can customise them until your heart’s content! If you’re after more easy and delicious vegan lunch recipes, check out my classic homemade falafels or my rainbow summer rolls! If you make this Buddha Bowl, make sure you share your pics with me on Instagram, just tag me @lemonthy.me so I can see your recreations! Also feel free, as always, to leave any questions, comments or suggestions below. Preheat your oven to 200°C (390°F) and line a baking tray, chop your sweet potato, toss it in half the olive oil and lay it out over half the tray. Drain and rinse your chickpeas and toss them in the other half of the olive oil and the paprika, spread them out on the other half of the tray. Bake for approximately 15 minutes or until well cooked. Pop your rice in a pot of water with a pinch of salt to boil until well cooked, drain and set aside. Grate your carrot and cucumber, slice your avocado and line your bowl with your greens. 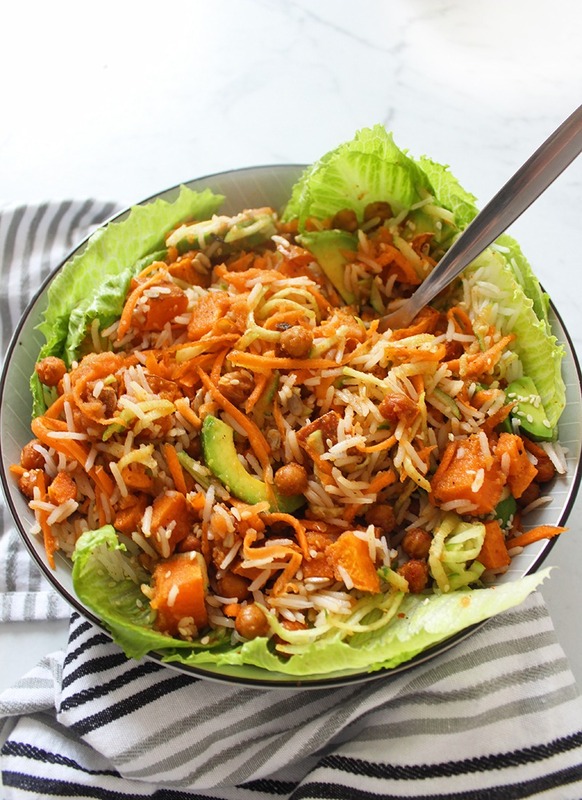 Now assemble your cooked rice, sweet potato, chickpeas, carrot, cucumber and avocado into the bowl. Put all the dressing ingredients into a blender to create the maple carrot dressing and drizzle this over the top. Sprinkle with the sesame and sunflower seeds and you’re ready to serve. Enjoy!